TTS (text-to-speech) features include synthesizing text into sound data as utterances and playing them. It is also possible to pause and stop playback. When your application creates a handle and prepares the TTS service, the TTS daemon is invoked and connected for background work. This daemon and your application communicate as the server and the client. You can connect the background TTS daemon to be able to operate TTS. The basic TTS processes allow you to register event handlers, add text, set the mode, and control the playback. You can also set TTS parameters. You can get information on the supported voices, and the current state and voice. Create a TTS handle which is used for distinguishing your application from other applications also using TTS. To get notifications about state changes, language changes, starting or finishing utterances, and errors, register event handlers. Add the text that you want to have read aloud by the TTS module. The requested text is handled as an utterance. You can add several texts, and they are managed using a queue. You can also pause and stop the playback. If you call the method to stop the playback, all requested data (both the sound data and text in the queue) is deleted. The credential is a key to verify the authorization for using the TTS engine. The necessity of the credential depends on the TTS engine. If the TTS engine requests the credential, you can set it using the SetCredential() method of the Tizen.Uix.Tts.TtsClient class. The private data is a setting parameter for applying keys provided by the TTS engine. Using the SetPrivateData() method of the Tizen.Uix.Tts.TtsClient class, you can set the private data as the corresponding key of the TTS engine. Get the current TTS state. The state is also applied as a precondition for each method. In TTS, the voice is defined as a combination of the language and the type, such as male or female. You can request the synthesis of the text with a specific voice, using the parameters of the AddText() method of the Tizen.Uix.Tts.TtsClient class. However, if you do not set a specific voice, TTS synthesizes the text with the default voice. The user can change the default voice in the device settings, by modifying the display language or the TTS default language status. If the display language is changed to a non-supported language, the TTS language is changed to UK English. The TTS handle is used in other TTS methods as a parameter. After the handle creation, the TTS state changes to Created. Note Do not use the Dispose() method inside an event handler. Within an event handler, the Dispose() method fails and invokes the OperationFailed error with the ErrorOccurred event of the Tizen.Uix.Tts.TtsClient class. TTS provides event handlers to get various information, such as state changes and the start or completion of an utterance. You can only register event handlers when the TTS state is Created. Retrieve the current TTS state by using the CurrentState property of the Tizen.Uix.Tts.TtsClient class. The TTS state is changed by various TTS methods, and it is applied as a precondition for each method. Get the default voice by using the DefaultVoice property. TTS synthesizes the text using the default voice, if you do not set the language and the voice type as parameters of the AddText() method of the Tizen.Uix.Tts.TtsClient class. You can get a notification about changes to the default voice by registering an event handler for the DefaultVoiceChanged event of the Tizen.Uix.Tts.TtsClient class. There are 3 different TTS modes available. The main difference is audio mixing with other sources. The default mode is Default, used for normal applications, such as e-books. If you set this mode and play your text, it can be interrupted when other sounds, such as ringtone or other TTS sounds, are played. Note The Notification and ScreenReader modes are mixed with other sound sources, but they are used only for platform-specific features. Do not use them for normal applications. After you create the TTS handle, connect the background TTS daemon with the Prepare() method of the Tizen.Uix.Tts.TtsClient class. The daemon synthesizes the text with the engine and plays the resulting sound data. The method is asynchronous and the TTS state changes to Ready. Note If the error event handler is invoked after calling the Prepare() method, TTS is not available. The private data is a setting parameter for applying keys provided by the TTS engine. To set the private data and use the corresponding key of the engine, use the SetPrivateData() method. You can request the TTS library to read your own text using the AddText() method of the Tizen.Uix.Tts.TtsClient class. The TTS library manages added text using queues, so it is possible to add several texts simultaneously. Each obtained text receives an utterance ID, which is used for synthesizing and playing the sound data. If the language parameter is NULL, the default language is used for synthesizing the text. You can add text to TTS at any point after the Prepare() method changes the TTS state to Ready. To start synthesizing the text added in the queue and play the resulting sound data in sequence, use the Play() method of the Tizen.Uix.Tts.TtsClient class. The TTS state is changed to Playing, and the playback continues until you call the Stop() or the Pause() method. If there is no text in the queue, TTS waits in the Playing state for text to be added. In that case, when you add text, TTS starts synthesizing and playing it immediately. 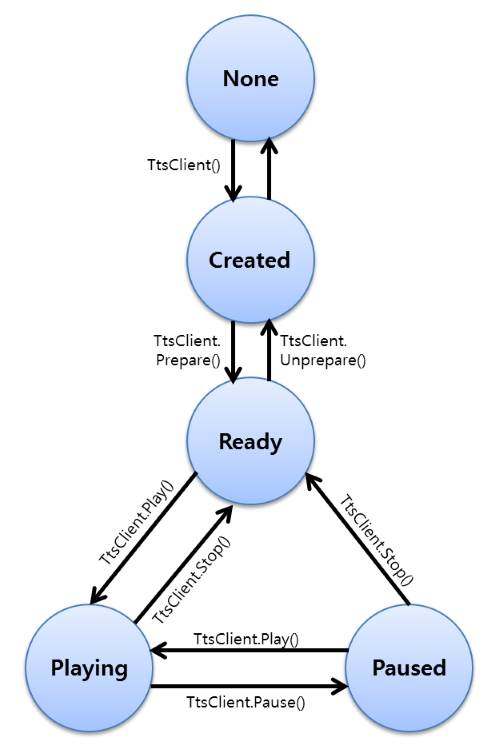 The TTS state need not change to Ready before using the Stop() method. Note If the TTS state changed event handler is invoked in the Playing state without a TTS method call, prepare the TTS state. The state can change if other applications request TTS play, the audio session requests TTS pause, or the TTS engine changes. To pause the playback, use the Pause() method. The TTS state is changed to Paused. To resume playback, use the Play() method. To stop the playback, use the Stop() method. All the texts in the queue are removed, and the TTS state is changed to Ready.